It is no secret that North Vancouver sees a lot of rain. As this rain falls, it can flood streets and drains but it can flood your gutters as well. If water is backing up around your home or business, a regular clearing of your drainage system is the solution to your problem. Protecting your property from water damage is a year-round necessity. This might be a tall order, but it doesn’t need to be a chore with a little help from a professional North Vancouver gutter cleaning service. Your eavestrough or gutter system is made to withstand the elements. They might be built tough, but it still takes a vigilant eye to make sure that exterior materials are running smoothly. Getting a proper view of items that have collected along surfaces is tough enough of its own, never mind removal! For every piece of organic material that finds itself sitting on your roof, there is a good chance that it will roll down into your upper perimeter drains. Over time, organics collect throughout pipes and downspouts, creating blockages and an impassable path for water. In a damp climate, sitting water paves the way for rot, water damage and even pest infestations. Organic material can be large or small; heavy or light. The most common culprits for clogs are twigs and leaves, becoming tangled up. Materials that are more dense fall to the bottom of pipes, creating a foundation for other debris (thanks, gravity!). Reaching into gunky drainage pipes, attempting to pull out bigger items does not do much to clear away clogs. Needles, seed pods, pinecones, and twigs are tough to dig out by hand. Leaving these bits and pieces behind will produce similar results to not doing the job at all. Luckily, our Gorillas are constantly developing new systems to strip away debris. 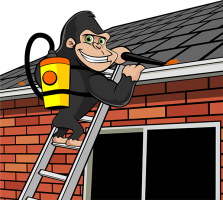 The best results for your North Vancouver gutter cleaning are always in reach for a Gorilla, so let us show you how its done! The first step to a proper service is assessment. Figuring out where your problem areas are is key to keeping them moving. Specially-designed tools allow our property maintenance specialists to treat opened and covered areas alike. High-powered vacuums and sponges ditch debris and keep gutters clear. A clean visual is not enough for our Gorillas to consider a job done. Water testing is a key aspect of a successful North Vancouver gutter cleaning. Only through proper water testing can our specialists make sure that there are no sneaky blockages hiding out in your system. In addition, our technicians take before and after pictures. This allows our clients to see that all safety standards have been followed to a Tee and the job has been carried out to full satisfaction. Technicians cater not only to clients but to the property itself. 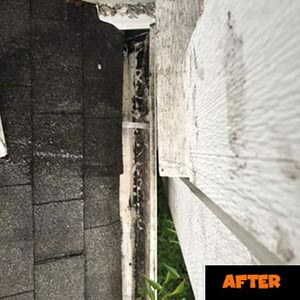 We recommend you have the gutters cleaned on your North Vancouver property at least once a year. However, some sites do require more frequent visits. The landscaping of North Vancouver is a little different than the other Lower Mainland cities.